Hope you have enjoyed the sneak peeks for past couple of days. Today is Day #3 of Taylored Expressions October Release. As always I will showcase two new products. The first one is a die called Woodland Silhouette 2. There is a Woodland Silhouette 1 die as well. But I am showcasing the bear die from the Woodland Silhouette 2 die set. This set also has a moose die. Anyway, here is my card using the bear die in the set. This is a simple card which can be mass produced as well. 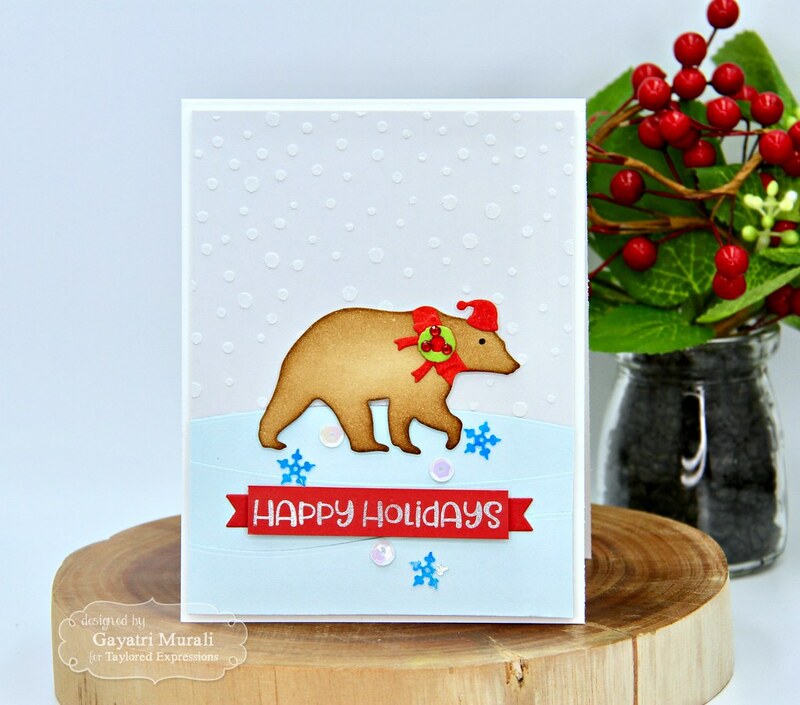 I used the new Sea Salt cardstock for the background panel upon which I added snow texture using the new Snow Flurry stencil and white embossing paste. I also used the new Snow Drifts die to create snow mounds on the bottom of the panel using Sprinkles cardstock. With the focal point which is the Woodland Silhouette 2 die Bear, I die cut using Suagr Cube cardstock and sponged Gathered Twigs and Vintage Photo on the die cut. 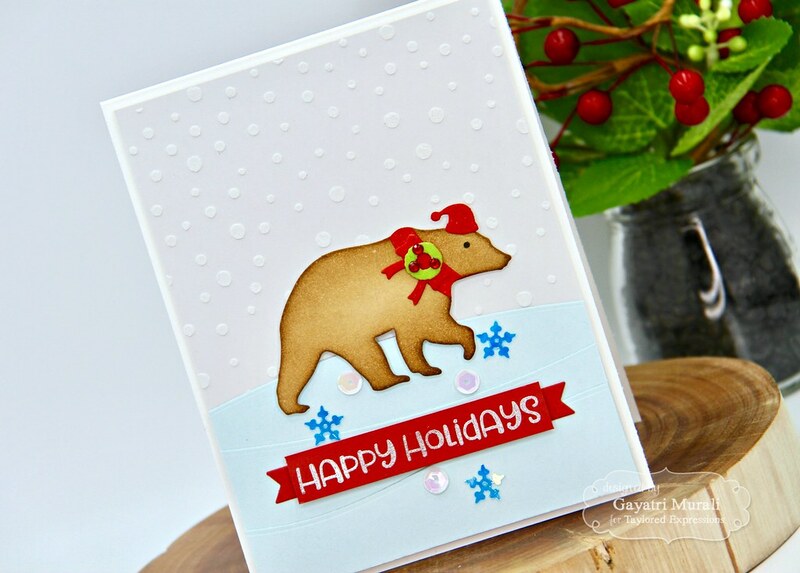 Then I used the Little Bits Christmas Confetti and Little Bits Santa Hat die to sponge Barn Door distress inks and add scarf and hat to the bear. I also added a wreath from the Little Bits Christmas Confetti die and decorated it with red rhinestones. 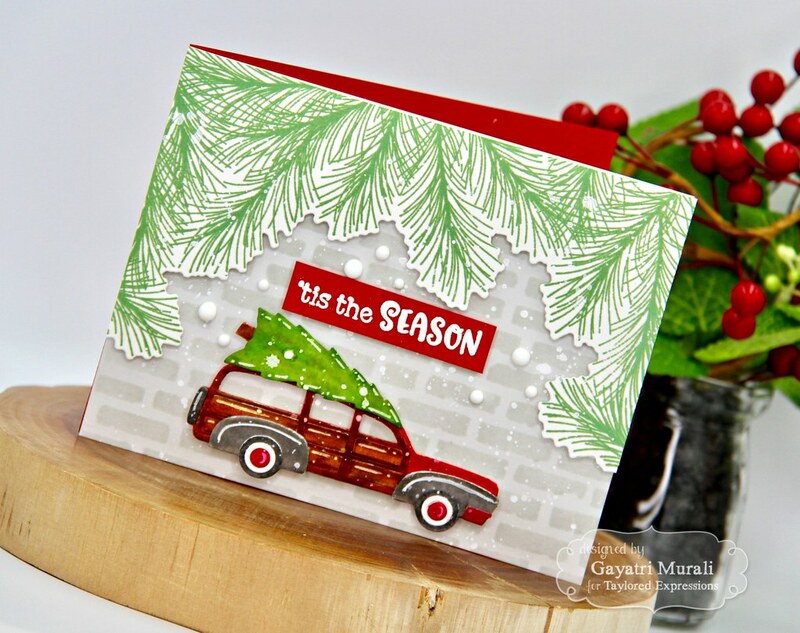 The sentiment is from Simply Said Christmas stamp set which I silver embossed using TE silver detailed embossing powder on a strip of Watermelon cardstock. I also used the smallest Doubled Ended Flag die to add fish tail banner on either ends of the sentiment strip and adhered below the focal bear die cut. 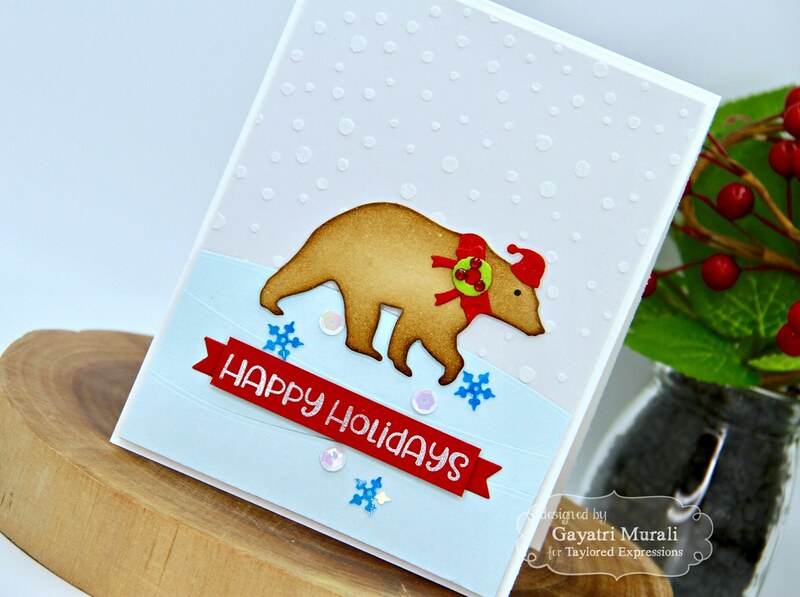 I adhered this completed panel to the Sugar Cube card front and embellished with TE Christmas sequins to finish off the card. 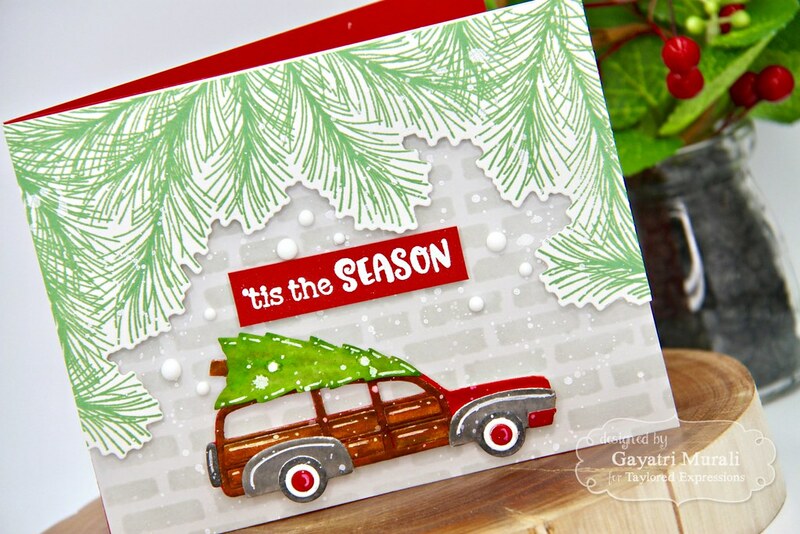 The second new product I am showcasing today is a die called On the Road-Station Wagon. This is a very cute die. I normally don’t like small fiddly pieces to assemble, so I put off making this card to the last. But once I started die cutting and assembling the station wagon, I got hooked to it because it is so darn cut. I used TE watercolour cardstock to die it and coloured using TE liquid watercolor. Here is the full card. I sponged the new Sea Salt dye ink on the new Brick by Brick stencil on Sea Salt panel to get tone on tone effect on the background. Then I stamped the new Pine Bough background stamp using the new Cilantro dye ink on Sugar Cube cardstock and die cut using the coordinating die. I adhered this pine Bough die cut on top of the Sea Salt panel using foam adhesive. On the bottom of the panel I adhered the On the Road Station Wagon die cut again using foam adhesives. To add some snow to the card front, I spattered some copic Opaque white all over the panel. 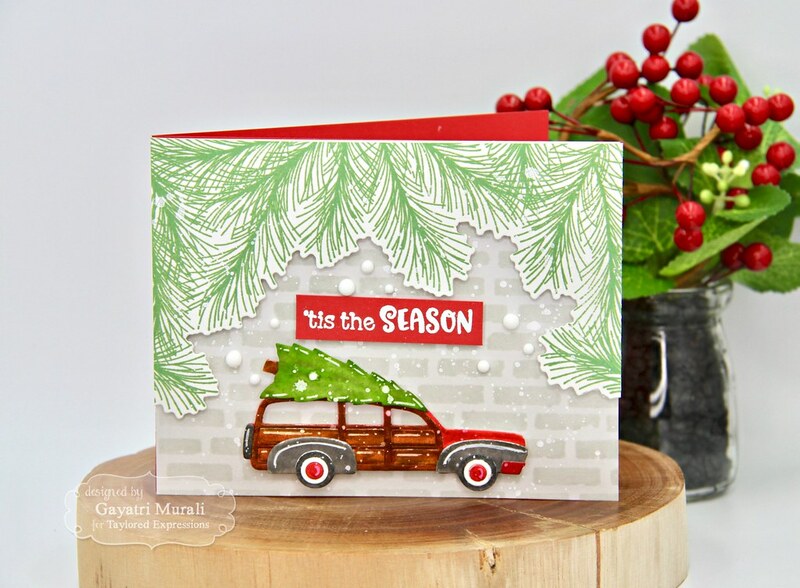 The sentiment is from On the Hinge Merry stamp set which I white heat embossed using TE white detailed embossing powder on to a strip of Watermelon cardstock. I adhered this strip above the station wagon die cut using foam adhesive. This completed panel is adhered to a Watermelon card base. To finish off the card, I added some white Nuvo crystal drops. 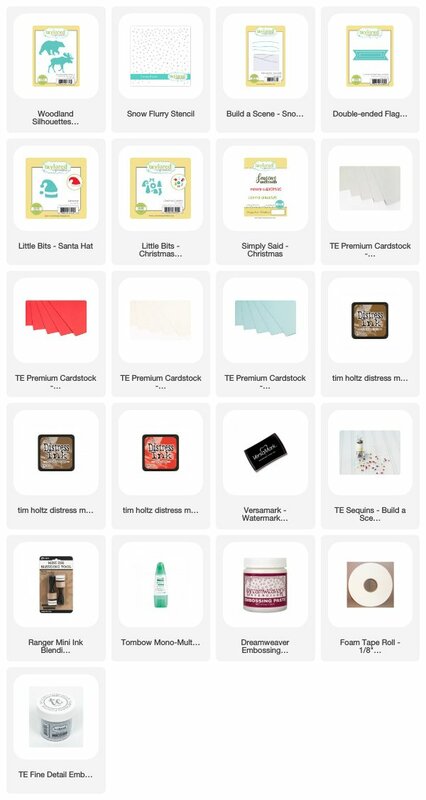 This ties in all the while elements on the card and brings the whole card together. Hope you enjoyed my projects today using the new Taylored Expressions October release. 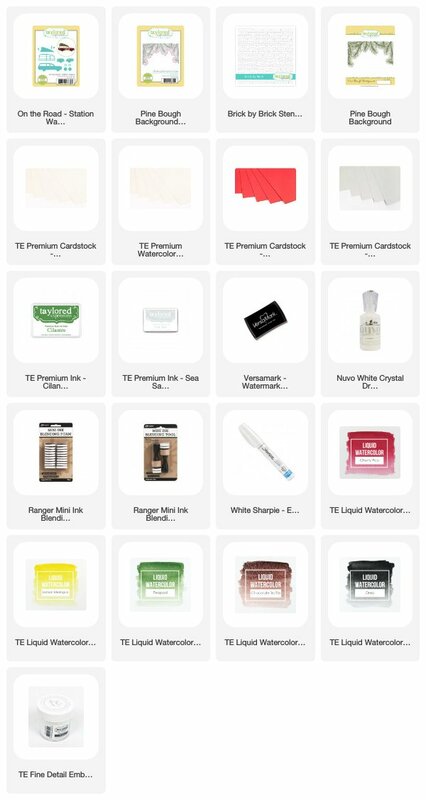 All the new release products are available for purchase tomorrow Thursday 4th October at 7am PDT at TE store. I will see you on the release day with more projects. Until then, have a lovely day!